Low price 40 amp solid state relay, 3 phase SSR-40DA, DC control, input voltage 3-32V DC, AC load voltage 24-480V AC, zero cross, panel mount, high quality SSR suitable for heavy industries. Quality solid state relay, SSR-60AA 60A , 3 phase, zero cross switch, 70-280V AC control voltage, 24-480V AC load voltage, panel mount, strong structure and high reliability. 3 phase 60 Amp solid state relay, SSR-60DA, zero cross, 3-32V DC control voltage, 24-480V AC load volatage, LED indicator, panel mount, high reliability, long lifespan and low price. 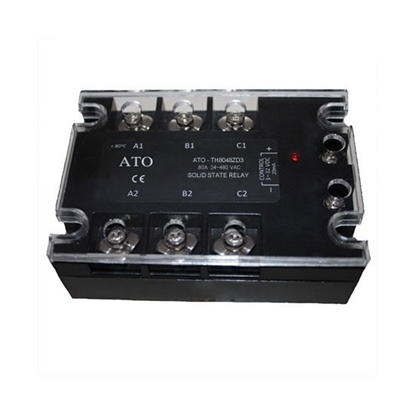 SSR-80AA solid state relay, 3 phase, zero-crossing switch, AC control, input voltage 70-280V AC, load current up to 40 amp, load volatge 24-480V AC, panel mount, high quality and long lifespan. SSR-80DA solid state relay, 3 phase, load current rating to 80A, voltage input 3-32V DC, load voltage 24-480V AC, zero cross, panel mount, excellent quality, long life, brand new and ideal for heavy industries. 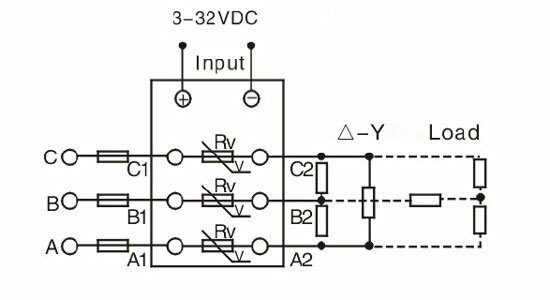 10A 3-phase DC to AC solid state relay (SSR) features high structural strength, good impact resistance, and strong shock resistance. The SSR offers a reliable switching the commercial and industrial loads, such as computer peripheral interface device, printing machine, molding machine, food machine, packaging machine, and so on. 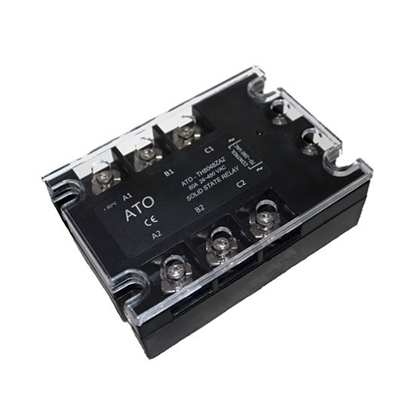 There is certain internal power dissipation in solid state relays’ operation. The dissipation value is mainly determined by product of output voltage drop and load current, embodied in the form of heat radiation. The quality of heat dissipation directly affects maximum load current of solid state relays and maximum allowable temperature of the working environment and it is one of the important factors that affect the reliable operation of SSRs. Therefore, we should pay attention to thermal design and radiator selection so that SSRs may work reliably and failure of and damages caused by poor heat dissipation to solid state relays can be avoided. In general, solid state relays, whose output current is less than 5A, use natural convection air enough to achieve the purpose of cooling, but when installed, solid state relays need a good convection environment and the space between each solid state relay should not be less than the width of a SSR. It is essential for those solid state relays with a load current greater than 10 A to use suitable radiators, even forced air cooling (air speed at 6 m/s) or water-cooling if necessary. The good heat dissipation condition is very important for SSRs’ reliable work. So far the SSR works great and no problems. I use this unit to switch a water pump on/off. The solid state relay indeed got hot while running without a heat sink. Then added a heat sink to make it running longer and safer. So far works great and no problems.